This article is about the divination method. For other uses, see Dowsing (disambiguation). Dowsing is a type of divination employed in attempts to locate ground water, buried metals or ores, gemstones, oil, gravesites, and many other objects and materials without the use of scientific apparatus. Dowsing is considered a pseudoscience, and there is no scientific evidence that it is any more effective than random chance. Dowsing is also known as divining (especially in reference to interpretation of results), doodlebugging (particularly in the United States, in searching for petroleum) or (when searching specifically for water) water finding, water witching (in the United States) or water dowsing. A Y- or L-shaped twig or rod, called a dowsing rod, divining rod (Latin: virgula divina or baculus divinatorius), a "vining rod" or witching rod is sometimes used during dowsing, although some dowsers use other equipment or no equipment at all. Dowsing appears to have arisen in the context of Renaissance magic in Germany, and it remains popular among believers in Forteana or radiesthesia. The motion of dowsing rods is nowadays generally attributed to the ideomotor effect. Dowsing as practiced today may have originated in Germany during the 15th century, when it was used in attempts to find metals. As early as 1518 Martin Luther listed dowsing for metals as an act that broke the first commandment (i.e., as occultism). The 1550 edition of Sebastian Münster's Cosmographia contains a woodcut of a dowser with forked rod in hand walking over a cutaway image of a mining operation. The rod is labelled "Virgula Divina – Glück rüt" (Latin: divine rod; German "Wünschelrute": fortune rod or stick), but there is no text accompanying the woodcut. 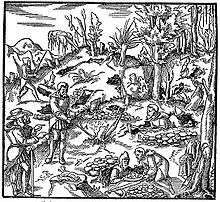 By 1556 Georgius Agricola's treatment of mining and smelting of ore, De Re Metallica, included a detailed description of dowsing for metal ore. In the sixteenth century, German deep mining technology was in enormous demand all over Europe and German miners were licensed to live and work in Elizabethan England particularly in the Stannaries of Devon & Cornwall and in Cumbria. 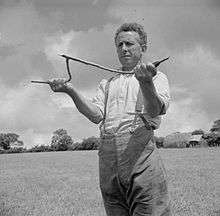 It is thought that the dialect term "dowsing" was introduced at this period – its origin is unknown but features characteristics of the West Country dialects. 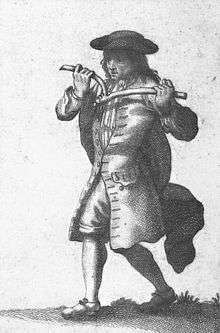 In 1662 dowsing was declared to be "superstitious, or rather satanic" by a Jesuit, Gaspar Schott, though he later noted that he wasn't sure that the devil was always responsible for the movement of the rod. In the South of France in the 17th century it was used in tracking criminals and heretics. Its abuse led to a decree of the inquisition in 1701, forbidding its employment for purposes of justice. For to the Wealthiest (ever) they incline." Dowsing was conducted in South Dakota in the late 19th and early 20th centuries to help homesteaders, farmers, and ranchers locate water wells on their property. In the late 1960s during the Vietnam War, some United States Marines used dowsing to attempt to locate weapons and tunnels. As late as in 1986, when 31 soldiers were taken by an avalanche during an operation in the NATO drill Anchor Express in Vassdalen, Norway, the Norwegian army attempted to locate soldiers buried in the avalanche using dowsing as a search method. Regardless of the scientific experiments, dowsing is still used by some farmers. Traditionally, the most common dowsing rod is a forked (Y-shaped) branch from a tree or bush. Some dowsers prefer branches from particular trees, and some prefer the branches to be freshly cut. Hazel twigs in Europe and witch-hazel in the United States are traditionally commonly chosen, as are branches from willow or peach trees. The two ends on the forked side are held one in each hand with the third (the stem of the Y) pointing straight ahead. Often the branches are grasped palms down. The dowser then walks slowly over the places where he suspects the target (for example, minerals or water) may be, and the dowsing rod dips, inclines or twitches when a discovery is made. This method is sometimes known as "willow witching". 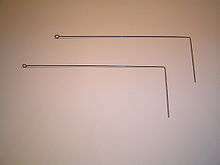 Many dowsers today use a pair of simple L-shaped metal rods. One rod is held in each hand, with the short arm of the L held upright, and the long arm pointing forward. When something is found, the rods cross over one another making an X over the found object. If the object is long and straight, such as a water pipe, the rods may point in opposite directions, showing its orientation. The rods are sometimes fashioned from wire coat hangers, and glass or plastic rods have also been accepted. Straight rods are also sometimes used for the same purposes, and were not uncommon in early 19th-century New England. In all cases, the device is in a state of unstable equilibrium from which slight movements may be amplified. A number of devices resembling "high tech" dowsing rods have been marketed for modern police and military use: none has been shown to be effective. The more notable of this class of device are ADE 651, Sniffex, and the GT200. A US government study advised against buying "bogus explosive detection equipment". Sandia National Laboratories tested the MOLE Programmable System manufactured by Global Technical Ltd. of Kent, UK and found it ineffective. The ADE 651 is a device produced by ATSC (UK) and widely used by Iraqi police to detect explosives. Many have denied its effectiveness and contended that the ADE 651 failed to prevent many bombings in Iraq. On 23 April 2013, the director of ATSC, James McCormick was convicted of fraud by misrepresentation and later sentenced to 10 years in prison. Earlier, the British Government had announced a ban on the export of the ADE 651. Sniffex was the subject of a report by the United States Navy Explosive Ordnance Disposal that concluded "The handheld Sniffex explosives detector does not work." Global Technical GT200 is a dowsing type explosive detector which contains no scientific mechanism. Dowsing is considered to be a pseudoscience. A 1948 study tested 58 dowsers' ability to detect water. None of them was more reliable than chance. A 1979 review examined many controlled studies of dowsing for water, and found that none of them showed better than chance results. A 2006 study of grave dowsing in Iowa reviewed 14 published studies and determined that none of them correctly predicted the location of human burials, and simple scientific experiments demonstrated that the fundamental principles commonly used to explain grave dowsing were incorrect. A randomized double-blind trial in 2012 was carried out to determine whether homeopaths were able to distinguish between Bryonia and placebo by use of a dowsing method. The results were negative. A 1990 double-blind study was undertaken in Kassel, Germany, under the direction of the Gesellschaft zur Wissenschaftlichen Untersuchung von Parawissenschaften (Society for the Scientific Investigation of the Parasciences). James Randi offered a US$10,000 prize to any successful dowser. The three-day test of some 30 dowsers involved plastic pipes through which water flow could be controlled and directed. The pipes were buried 50 centimeters (19.7 in) under a level field, the position of each marked on the surface with a colored strip. The dowsers had to tell whether water was running through each pipe. All the dowsers signed a statement agreeing this was a fair test of their abilities and that they expected a 100 percent success rate. However, the results were no better than chance, thus no one was awarded the prize. In a 1987-88 study in Munich by Hans-Dieter Betz and other scientists, 500 dowsers were initially tested for their skill, and the experimenters selected the best 43 among them for further tests. Water was pumped through a pipe on the ground floor of a two-storey barn. Before each test, the pipe was moved in a direction perpendicular to the water flow. On the upper floor, each dowser was asked to determine the position of the pipe. Over two years, the dowsers performed 843 such tests and, of the 43 pre-selected and extensively tested candidates, at least 37 showed no dowsing ability. The results from the remaining 6 were said to be better than chance, resulting in the experimenters' conclusion that some dowsers "in particular tasks, showed an extraordinarily high rate of success, which can scarcely if at all be explained as due to chance ... a real core of dowser-phenomena can be regarded as empirically proven." Five years after the Munich study was published, Jim T. Enright, a professor of physiology who emphasised correct data analysis procedure, contended that the study's results are merely consistent with statistical fluctuations and not significant. He believed the experiments provided "the most convincing disproof imaginable that dowsers can do what they claim", stating that the data analysis was "special, unconventional and customized". Replacing it with "more ordinary analyses", he noted that the best dowser was on average 4 millimeters (0.16 in) out of 10 meters (32.81 ft) closer to a mid-line guess, an advantage of 0.04%, and that the five other "good" dowsers were on average farther than a mid-line guess. Enright emphasized that the experimenters should have decided beforehand how to statistically analyze the results; if they only afterward chose the statistical analysis that showed the greatest success, then their conclusions would not be valid until replicated by another test analyzed by the same method. He further pointed out that the six "good" dowsers did not perform any better than chance in separate tests. Another study published in Pathophysiology hypothesized that such experiments as this one that were carried out in the 20th century could have been interfered with by man-made radio frequency radiation, as test subjects' bodies absorbed the radio waves and unconscious hand movement reactions took place following the standing waves or intensity variations. The corpuscles... that rise from the Minerals, entering the rod, determine it to bow down, in order to render it parallel to the vertical lines which the effluvia describe in their rise. In effect the Mineral particles seem to be emitted from the earth; now the Virgula [rod], being of a light porous wood, gives an easy passage to these particles, which are also very fine and subtle; the effluvia then driven forwards by those that follow them, and pressed at the same time by the atmosphere incumbent on them, are forced to enter the little interstices between the fibres of the wood, and by that effort they oblige it to incline, or dip down perpendicularly, to become parallel with the little columns which those vapours form in their rise. Such explanations have no modern scientific basis. A 1986 article in Nature included dowsing in a list of "effects which until recently were claimed to be paranormal but which can now be explained from within orthodox science." Specifically, dowsing could be explained in terms of sensory cues, expectancy effects and probability. Skeptics and some supporters believe that dowsing apparatus has no power of its own but merely amplifies slight movements of the hands caused by a phenomenon known as the ideomotor effect: people's subconscious minds may influence their bodies without their consciously deciding to take action. This would make the dowsing rods a conduit for the diviner's subconscious knowledge or perception; but also susceptible to confirmation bias. Soviet geologists have made claims for the abilities of dowsers, which remain unverified by any credible scientific means. Some authors suggest that these abilities may be explained by postulating human sensitivity to small magnetic field gradient changes. In the 1970s the physicists John Taylor and Eduardo Balanovski in a series of experiments searched for unusual electromagnetic fields emitted by dowsing subjects but did not detect any. Science writer Peter Daempfle has noted that when dowsing is subjected to scientific testing, it fails. Daempfle has written that although some dowsers claim success, this can be attributed to the underground water table being distributed relatively uniformly in certain areas. Douster-Swivel, a character in Walter Scott's novel, The Antiquary. The word dousterswivel appears in Brewer's Dictionary of Phrase and Fable, first published in 1870, with the definition: "A German swindler, who obtains money under the promise of finding buried wealth by a divining-rod." ↑ Kenney, Andrew. "Grave Hunters," The Herald 29 July 2009, p. 1. 1 2 Vogt, Evon Z.; Ray Hyman (1979). Water Witching U.S.A. (2nd ed.). Chicago: Chicago University Press. ISBN 978-0-226-86297-2. via Hines, Terence (2003). Pseudoscience and the Paranormal (Second ed.). Amherst, New York: Prometheus Books. p. 420. ISBN 978-1-57392-979-0. ↑ "Dowsing, Doodlebugging, and Water Witching". Association of Independent Readers and Rootworkers Wiki. Retrieved 11 October 2011. ↑ "Keystone Folklore Quarterly". 1967. ↑ As translated from one preface of the Kassel experiments, "roughly 10,000 active dowsers in Germany alone can generate a conservatively-estimated annual revenue of more than 100 million DM (US$50 million)". GWUP-Psi-Tests 2004: Keine Million Dollar für PSI-Fähigkeiten (in German) and English version. ↑ Novella, Steve; Deangelis, Perry. (2002). Dowsing. In Michael Shermer. The Skeptic Encyclopedia of Pseudoscience. ABC-CLIO. pp. 93-94. ISBN 1-57607-654-7 "Despite widespread belief, careful investigation has demonstrated that the technique of dowsing simply does not work. No researcher has been able to prove under controlled conditions that dowsing has any genuine divining power... A more likely explanation for the movement of a dowser's focus is the ideomotor effect, which entails involuntary and unconscious motor behavior." ↑ One or more of the preceding sentences incorporates text from a publication now in the public domain: Chisholm, Hugh, ed. (1911). "Divining-rod". Encyclopædia Britannica. 8 (11th ed.). Cambridge University Press. pp. 333–334. ↑ Grace Fairchild and Walker D. Wyman, Frontier Woman: The Life of a Woman Homesteader on the Dakota Frontier (River Falls: University of Wisconsin-River Falls Press, 1972), 50; Robert Amerson, From the Hidewood: Memories of a Dakota Neighborhood (St. Paul: Minnesota Historical Society Press, 1996), 290-98. ↑ Rolf Manne (2005). "Ønskekvist i snøskred – psevdovitenskap i praksis?". Pseudovitenskap og Etikk, published at Norwegian University of Science and Technology, page 45. ↑ "'James McCormick guilty of selling fake bomb detectors". BBC News. 2013-04-23. Retrieved 2013-04-23. ↑ "Government statement on 'bomb detectors' ban". BBC News. 2010-01-22. Retrieved 2010-05-01. ↑ "Tests show bomb scanner ineffective, Thailand says". CNN. 2010-02-17. ↑ Ongley, P. (1948). "New Zealand Diviners". New Zealand Journal of Science and Technology. 30: 38–54. via Hines, Terence (2003). Pseudoscience and the Paranormal (Second ed.). Amherst, New York: Prometheus Books. p. 420. ISBN 978-1-57392-979-0. ↑ Whittaker, William E. "Grave Dowsing Reconsidered" (PDF). Office of the State Archaeologist, University of Iowa. Retrieved 17 June 2013. ↑ McCarney R, Fisher P, Spink F, Flint G, van Haselen R. (2002). Can homeopaths detect homeopathic medicines by dowsing? A randomized, double-blind, placebo-controlled trial. Journal of the Royal Society of Medicine 95: 189-191. ↑ GWUP-Psi-Tests 2004: Keine Million Dollar für PSI-Fähigkeiten (in German) and English version. ↑ Wagner, H., H.-D. Betz, and H. L. König, 1990. Schlußbericht 01 KB8602, Bundesministerium für Forschung und Technologie. As quoted by Jim T. Enright in the Skeptical Inquirer. ↑ Enright, Jim T. (January–February 1999). "The Failure of the Munich Experiments". Skeptical Inquirer. CSICOP. Retrieved 2006-11-14. The researchers themselves concluded that the outcome unquestionably demonstrated successful dowsing abilities, but a thoughtful re-examination of the data indicates that such an interpretation can only be regarded as the result of wishful thinking. ↑ Enright, J. T. (1995). "Water dowsing: The Scheunen experiments". Naturwissenschaften. 82: 360–369. doi:10.1007/s001140050198. ↑ Enright, J. T. (June 1996). "Dowsers lost in a Barn" (PDF). Naturwissenschaften. Springer Berlin / Heidelberg. 83 (6): 275–277. doi:10.1007/BF01149601. ISSN 1432-1904. Retrieved 2009-09-26. 1 2 Marks, David F. (March 13, 1986). "Investigating the paranormal". Nature. Nature Publishing Group. 320 (6058): 119–124. doi:10.1038/320119a0. ISSN 0028-0836. PMID 3951553. ↑ Williamson, T (1979). "Dowsing achieves new credence". New Scientist. 81: 371. ↑ Rocard, Y (1981). La Recherche 12: 792. ↑ Presti, D.; Pettgrew, J. (1980). "Ferromagnetic coupling to muscle receptors as a basis for geomagnetic field sensitivity in animals". Nature. 285 (5760): 99. doi:10.1038/285099a0. ↑ Baker, R (1983). "Magnetic bones in human sinuses". Nature. 301 (5895): 78. doi:10.1038/301078a0. Barrett, William and Theodore Besterman. (1926). The Divining Rod: An Experimental and Psychological Investigation. Kessinger Publishing Reprint Edition, 2004. Culpin, Millais. (1920). Chapter Water-Divining. In Spiritualism and the New Psychology: An Explanation of Spiritualist Phenomena and Beliefs in Terms of Modern Knowledge. Edward Arnold, London. Bird, Christopher, The Divining Hand, 1979. Thomas Fiddick (2011). Dowsing: With an Account of Some Original Experiments. Sheffield, United Kingdom: The Cornovia Press. p. 3. ISBN 1-908878-10-X. Randi, James, Flim-Flam!, 1982. Devotes 19 pages to double-blind tests in Italy which yielded results no better than chance. Spiesberger, Karl, Reveal the Power of the Pendulum. Underwood, Guy, The Pattern of the Past, Museum Press 1969; Sir Isaac Pitman & Sons Ltd 1970; Abacus 1972. Vermeir, K (Mar 2005). "The physical prophet and the powers of the imagination. Part II: a case-study on dowsing and the naturalisation of the moral, 1685-1710". Studies in History and Philosophy of Biological and Biomedical Sciences. 36 (1): 1–24. doi:10.1016/j.shpsc.2004.12.008. Wikimedia Commons has media related to Dowsing. James Randi, "The Matter of Dowsing"